When conducting cross-tabulation analysis in practice, it is useful to proceed along the following steps. 1. Test the null hypothesis that there is no association between the variables using the chi square statistic. If you fail to reject the null hypothesis, then there is no relationship. 2. If Ho is rejected, then determine the strength of the association using an appropriate statistic (phi coefficient, contingency coefficient. Cramer’s V. lambda coefficient. or other statistics). 3. If Ho is rejected, interpret the pattern of the relationship by computing the percentages in the direction of the independent variable, across the dependent variable. 4. If the variables are treated as ordinal rather than nominal, use tau b, tau c, or gamma as the test statistic. If Hο is rejected, then determine the strength of the association using, the magnitude, and the direction of the relationship using the sign of the test statistic. 5. Translate the results of hypothesis testing, strength of association, and pattern of association into managerial implications and recommendations where meaningful. The previous section considered hypothesis testing related to associations. We now focus on hypothesis testing related to differences. 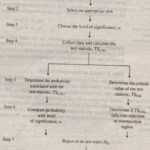 A classification of hypothesis-testing procedures for examining differences is presented in Figure 15.9. Note that Figure 15.9 is consistent with the classification of univariate techniques presented in Figure 14.6. The major difference is that Figure 14.6 also accommodates more than two samples and thus deals with techniques such as one-way ANOVA and K-W ANOVA, whereas Figure-15.9 is limited to no more than two samples. 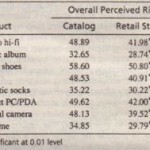 Also, one-sample techniques such as frequencies, which do not involve statistical testing, are not covered in Figure 15.9. Hypothesis-testing procedures can be broadly classified as parametric or non-parametric, based on the measurement scale of the variables involved. Parametric tests assume that the variables of interest are measured on at least an interval scale. Non-parametric tests assume that the variables are measured on a nominal or ordinal scale. These tests can be.further classified based on whether one, two. or more samples are involved. As explained in Chapter 14, the number of samples is determined based on how the data are treated for the purpose of analysis, not based on how the data were collected. The samples are independent if they are drawn randomly from different populations.For the purpose of analysis, data pertaining to· different groups of respondents, for example, males and females, are generally treated as independent samples. On the other hand, the samples are paired when the data for the two samples relate to the same group of respondents. The most popular parametric test is the test, conducted for examining hypotheses about means. The t test could be conducted on the mean of one sample or two samples of observations. In the case of two samples, the samples could be independent or paired. Non-parametric tests based on observations drawn from one sample include the Kolmogorov-Smimov test, the chi-square test, the runs test, and the binomial test. In case of two independent samples, the Mann-Whitney U test, the median test, and the Kolmogorov-Smimov two-sample test are used for examining hypotheses about location. 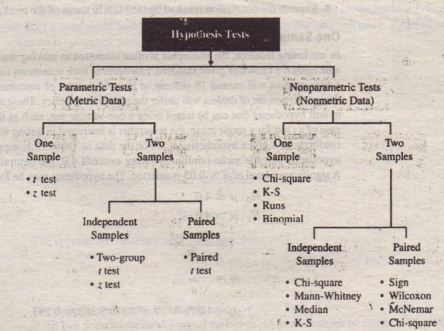 These tests are non-parametric counterparts of the two-group t test. The chi-square test can also be conducted. For paired samples, non parametric tests include the Wilcox on matched pairs signed-ranks test and the sign test. These tests are the counterparts of the paired test to addition the McNemar and chi-square tests can also be used, Parametric as well as non-parametric tests are also available for evaluating hypotheses relating to more than two samples.